Mike O'Dell provided inspirational music. 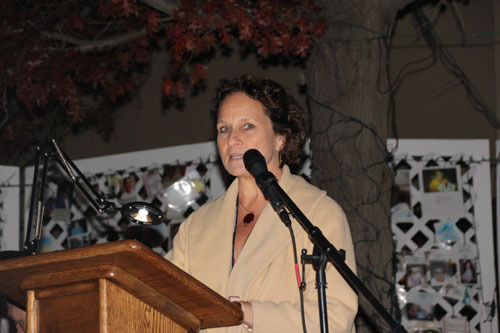 Christine McIntosh, the founder of Light Up a Life moderates the 17th annual ceremony. 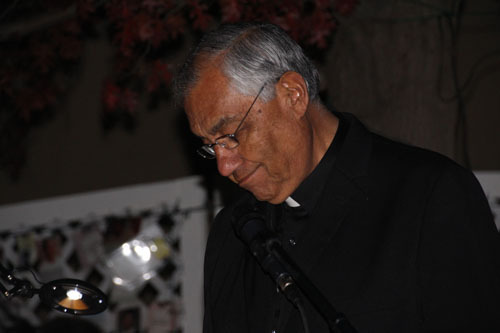 GRMC Chaplain Bill Holguin says a prayer over the ceremony. 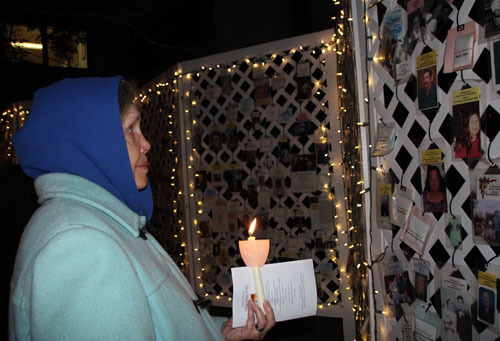 After the ceremony, Janet Thompsen looks for the photo of her son, Danny. 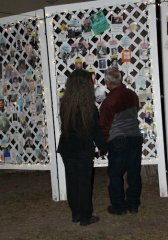 An unidentified couple look at the photos. 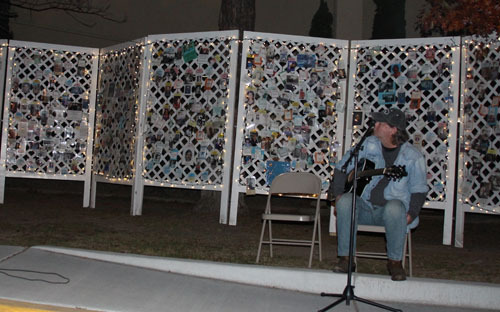 Gila Regional Medical Center hosted its 13th annual Light Up a Life ceremony near the front entrance to the hospital Thursday evening, Nov. 29, 2018. Candles were handed out for attendees. A staff member lit the candle at each end of a row for that person holding the candle to pass the flame to the candle held by the person next to them and on down the row. Founder Christine McIntosh served as the moderator of the event. She introduced Mike O'Dell who started the music with "Sound of Silence" on instrumental guitar, with one verse sung by him. He said he appreciated the ceremony because he had lost his daughter at birth. McIntosh then introduced GRMC Chief Executive Officer Taffy Arias, by saying that "Arias works tirelessly to provide compassion for our patients." Arias said, at the event last year, Silver City Mayor Ken Ladner had told such a moving story, that she found it hard to speak after him. "Tonight, I'll tell you about my grandmother," she continued. "My real grandmother died when my mother was young, so I am talking about my step-grandmother. I'm a city girl and she lived in a rural area. I used to spend summers with her. I watched her cook, make jelly and do other things on the farm. I tried my best to do what she did, but she didn't ever seem to approve of what I did. I tried to do things to please her, but I always felt like she just didn't like me. When she died at 103, there were only three people there, me, her biological daughter and her son-in-law." Arias recounted that the reverend talked about Miss Lucy and what a good person she was and all the children she had helped in the community and all the wonderful things she had done. "I kept saying to myself, 'she just didn't like me.' After the ceremony, the three of us were together. Her son-in-law said: 'You know, when the minister talked about her, I asked myself, 'Who is he talking about?' I used to fix everything that she needed fixing, but somehow, I never did it right. I couldn't please her.'" "So, it wasn't just me," Arias said. "It's funny, but she's the one I remember best. I learned from her how to cook chicken and dumplings, fry squirrel, embroider, cross-breed trees, tend turkeys. I learned how to carry a rifle and how to shoot it. I learned how to be a woman." Chaplain Bill Holguin gave the memorial prayer. "As always, it’s a privilege to be here. I've been here with many families in their times of grief. I've always felt like I went away with more than I gave." He then offered a prayer that grief might be turned to gratitude for what the deceased had given their loved ones. 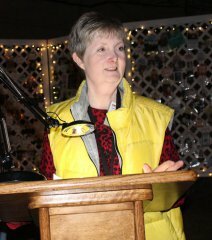 McIntosh led a responsive reading where those gathered replied after each verse: "We remember them." She introduced the special guest speaker Dr. Gregory Koury, who has served on staff for 15 years. He is now Chief of Staff. "Death and dying is part of my practice," Koury said. "I did some research. We hear about the stages of grief. But you can't put grief in a box. We need to remember our loved ones and grow beyond their death. We are getting better at bereavement." He recognized the members of the Emergency Medical Services that attended. "They bereave for people they don't even know." "We want to remember our loved ones," Koury continued. "Bereavement is unique to everyone. You may need help at times. We are not supposed to forget our loved ones. We need to use them for us to have a better life." He said it was much harder for those left after a traumatic or abrupt death. "It can be hard to recover. I tell my patients to get help. Medications don't make it better. I don't really like medications. What makes it better? People do. So, if you need help, ask for it. And if you know someone who has lost someone, help them and take care of them." 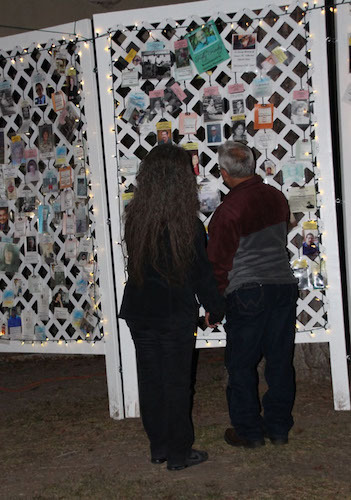 David Peck lit the lights around the latticed walls that held the photos of loved ones. "The lights will remain lit for the month of December," McIntosh said. "This experience is one we can share. Whenever we feel alone, we must remember that we are not alone. We are here to care." 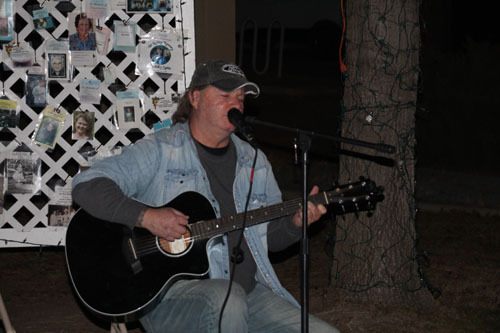 O'Dell played the instrumental guitar music of "Dust in the Wind." 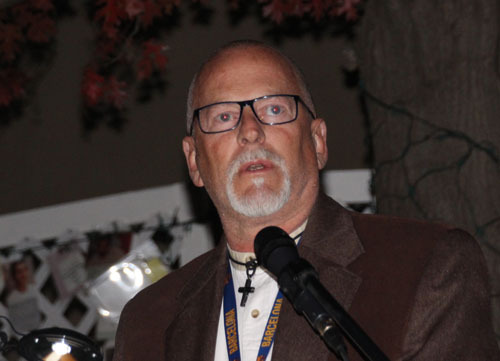 McIntosh asked people "to reflect on the gifts you have received as a result of this loss. Yes, there is pain, but also beauty and life." O'Dell ended the evening with "Stairway to Heaven." Refreshments were served in the lobby of the hospital. 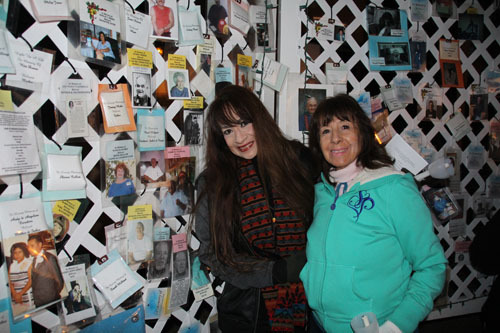 People approached the walls of photos and searched for their loved ones.